The Heavy are exactly that. Dirty, gritty, raw bluesy rock from Noid, UK, a tiny village in the back country southwest of Bath. 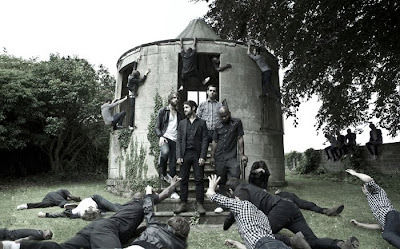 Core members guitarist Dan Taylor and vocalist Kelvin Swaby have been making music together for almost two decades, and the current lineup, including drummer Chris Ellul and bassist Spencer Page, released their second album, The House That Dirt Built, in late 2009. Mixing unrefined American styles, The Heavy creates a feral concoction that pulls from soul, garage rock (“Oh No! Not You Again!” featuring The Noisettes frontwoman Shingai Shoniwa), blues, reggae (“Cause For Alarm”), funk, and hip-hop (“Girl”). From the The Sonics to Parliament to James Brown, The Heavy have taken the best and rebuilt it into their own dirty house. With the vintage crunch of a scratched 45, The Heavy are real–a Black Keys that’s added horns and an emcee on the mic. Howling and growling, Swaby draws inspiration from Curtis Mayfield, Prince and Al Green while his coarse lyrics defile your body, leaving you feel grubby immersed in their glorious groove. Serious Business is getting slightly more serious. Serious about recording an album. Serious about making music videos. And serious about guerilla performances… coming to an alley near you this summer! 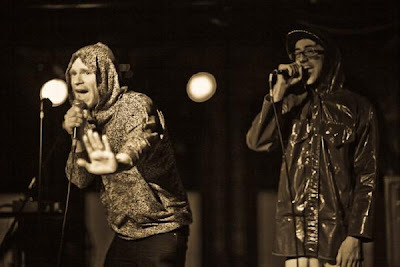 The dippy electro-party rap group began a year and half ago as a duo with Danny Diana-Peebles contributing half of the vocals and Jason Mampel providing the other half along with programming electronics and modeling Mickey Mouse attire. With themes ranging from homoeroticism to sweet treats, the two vocalists work back and forth with their rap conversations where the humorously lewd lyrics build off one another to a sampled synth bumping climax. It’s no surprise that MGMT are going to do exactly what they want. They’re going to change like the psychedelic, schizophrenic chameleon that they are. They’re not going to appease record labels or critics. But they might just indulge their concertgoers. MGMT visited the Crystal Ballroom playing two sold-out shows on Tuesday and Wednesday this week. If you’d delved into their latest release, Congratulations, you were well-prepared for their offering. On Tuesday, MGMT played a straightforward set that included almost everything the audience wanted to hear: all the old hits peppered with other tracks from their first album, Oracular Spectacular, alongside slower, experimental guitar-heavy jams from their second album. If you hadn’t heard the new album and attended the gig based solely on the collegiate party pop of their debut, you were definitely bored during stints of the new, and even some of the less upbeat old. But MGMT ever so politely tried not overburden you with new, playing equally from both albums and included “Destrokk” from the Time To Pretend EP. “Nothing gets me out to Sasquatch at noon,” said a concertgoer after witnessing the soulful, bluesy grit of UK rockers The Heavy who kicked off the final day of Sasquatch on the main stage. It’s an endeavor to stay inside the The Gorge Amphitheatre for 10 to 12 hours of music, and often festival goers neglect a few early acts for a later start. But numerous fans continued to gush praise for The Heavy, remarking that the quartet, plus guest brass, should have replaced Pavement on the Sunday night bill. Posting up on the side stage was the thin-mohawked Kelvin Swaby to witness an utterly different breed of soul-inspired grooves. Yellow tambourine in hand, a carefree Mayer Hawthorne brought his timeless, white boy Motown to the main stage. Bopping and clapping on sugary tunes like “Your Easy Lovin’ Ain’t Pleasin’ Nothin,” the sun peaked out to shine on his sunny soul music. The audience screamed when asked and smiled at his cheesy, endearing interludes. From the jazz club to the open air, Mayer Hawthorne and The County soaked up the adoration with funky basslines and a few bars of Snoop Dogg’s “Gangsta Luv,” a track which Mayer Hawthorne remixed for the Top Dogg. Read about sets from Neon Indian, She & Him, MGMT, Passion Pit, and more on OMN. Sasquatch! Music Festival creator Adam Zacks has put together a show that rivals its natural surroundings. For those artists that failed to mention the magnificence of the venue while they were on stage, they were damn well thinking about it as they rocked one of the four breezy stages. But diversity is the draw as Sasquatch combined reunited acts with the blogosphere buzz, and those same artists were also awed by their contingent. In its ninth year, the Memorial Day weekend festival at The Gorge Amphitheatre brought together indie rock and hip-hop, electro dance tents and down tempo trip-hop to a sold out sward of 20,000+ concertgoers. And in its third year as a three-day event, Saturday was lovely, Sunday was dance-y, and Monday threatened to rain but instead shone with sunny giddiness. Indulging in ridiculousness, Sunday’s middy pageantry was typified by They Might Be Giants’ geeky adult rock on the main stage. Replete with a raunchy puppet show, their sparse comical rock was fun, even for “Your Racist Friend,” as TMBG showed the crowd some stompin’ and clappin’ jams from their back catalogue while making it obvious, through their stupid antics, just how easy the transition to kiddie tunes has been for the duo of John Flansburgh and John Linnell, who’ve been together for more than 25 years, and crew. Read about sets from LCD Soundsystem, Massive Attack, Public Enemy, Booka Shade, and more on OMN.